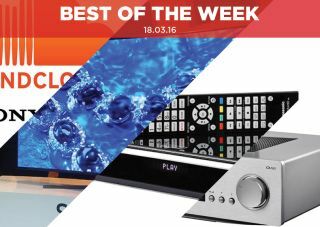 Best of the Week: Panasonic 4K Blu-ray player, 4K coming to Sky Q, 2016 Samsung TVs and more | What Hi-Fi? This week Samsung revealed its new line-up of TVs for 2016, SoundCloud hinted it was about to enter the paid music streaming market, Sky announced its premium Sky Q service would be getting 4K content in time for summer and Pioneer launched three new affordable surround amps. Elsewhere we had a couple of major reviews in the shape the first Ultra HD Blu-ray player from Panasonic and a stereo amplifier from Cambridge Audio. Samsung announced its TV range for 2016, with 3D being a notable omission from all of its sets. There will be a total of 15 new ranges including Full HD and Ultra HD TV models, all of which feature LED backlighting. If you're looking for an OLED, Samsung won't be making one this year. All 4K sets will come will come with HDR support, as well as support for Netflix, Amazon and YouTube 4K services. The TVs will be available from March 2016 onwards. SoundCloud looks to be entering the paid subscription service arena after signing a deal with Sony to licence its music. In return Sony has purchased a stake in SoundCloud, who now have agreements with three major labels – the other two being Warner Music Group and Universal Music Group. It's been reported that a stipulation of the deal is that SoundCloud will have to release a paid subscription service similar to Apple Music and Spotify. When it will arrive is unknown, but if true it means the music streaming market is about to get even more crowded. Sky's director of strategy Nick Herm has confirmed that the broadcaster will have a 4K Ultra HD service running on its Sky Q set-top box in time for the summer. When up and running it could provide competition for BT Sport's Ultra HD channel for live 4K content. It could also offer a wider range of 4K on-demand content. He also revealed that Sky has plans to add voice control to Sky Q in the near future, with a new Now TV box also in the pipeline. Pioneer has launched three new affordable surround amps with the lowest priced model starting at £300. The VSX-531 (£300) and VSX-831 (£450) are 5.1 channel amps and the VSX-1131 (£550) a 7.1 channel model. All models are HDCP compliant, with the 831 and 1131 HDR compatible. The latter will have Dolby Atmos out of the box with DTS:X support arriving further down the line. They all go on sale in April. "The moment has finally come, and it is with great excitement that we confirm the UHD Blu-ray is a real thing." 4K is apparently the future and with Panasonic's Ultra HD Blu-ray player it's now one step closer to being a reality. For a first effort you could expected that the DMP-UB900 would have come with a few flaws. That's not the case here as the player showcases 4K content to the full, displaying stunning clarity, vivid colours and strong contrast. We could not have dreamed of a stronger first effort. Panasonic has knocked it out of the park. If you already own a 4K TV, you now have a player to match. "In design and use, the CXA80 is a lovely piece of kit"
Cambridge Audio's run of late has been mightily impressive and the CXA80 is another strong effort. It has a powerful sound, with plenty of weight and satisfying sense of clarity. That are a few issues to speak of. The CXA80 sounds a tad restricted, sounding less agile and expressive as its rivals. Even so, this is an impressive effort and a lovely looking piece of kit.